A profile of Louise Leakey, famed paleontologist and the director of public education and outreach for the Turkana Basin Institute. Louise is a third-generation paleontologist. Her grandparents, Louis and Mary Leakey, led expeditions in Olduvai Gorge, Tanzania. Her parents, Richard and Meave Leakey, focused their research on the fossil-rich Turkana Basin in Kenya. Louise often works with her parents as she continues to study the ancient history of the Turkana Basin. She is an assistant research professor at the State University of New York at Stony Brook and is the director of public education and outreach for the Turkana Basin Institute in Nariobi, Kenya. Along with her mother, Louise is a National Geographic Explorer-in-Residence. Louise grew up in Nairobi, Kenya, and was able to accompany her parents on expeditions to the Lake Turkana area. "Everybody enjoys being out-and-about as a small child looking for fossils, so it is second-nature to anyone to do that," Louise says. "I guess I was able to keep at it longer than most." One of Louise's most memorable early experiences was when a team led by her father, Richard, found "Turkana Boy," a nearly complete, 1.5 million-year-old skeleton of the hominid Homo erectus. "At age 12, the discovery of the Homo erectus from the west side of Turkana was a very exciting time, because we were at that site for quite a long period," Louise says. "We were able to engage and help and excavate it. There was a real sense of excitement about that excavation." Even though her family is world-renowned for their work in paleontology, Louise never felt pressured to follow her parents into the field. "They never told me that is what I should do," she says. "I made this decision myself." 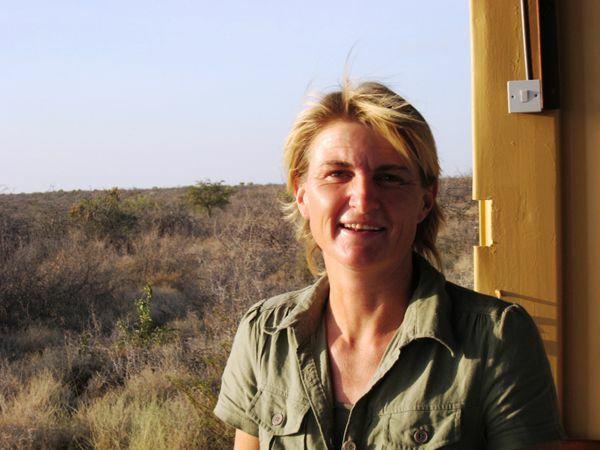 Louise left Africa for a few years to attain her PhD in biology at University College London in London, England, but soon returned to Kenya, and the Turkana Basin. These days, Louise spends a lot of time lecturing, fundraising, and raising her two children, but she still gets to the Turkana Basin in the summer for field work. "Being up there is certainly very exciting to get away from it all," she says. "It is a great pleasure to be hands-on and do it." "Trying to fit it all in, I would think. It's rather all over the place doing so many different things: field work, lectures, fundraising, and being a mother. Trying to raise support for the Institute, which we are working on now, takes quite a lot of attention and effort. It is quite demanding at this point in time." "I think of it more in terms of where things are in the world. The physical geography has always interested me. The mountains and lakes and their influences on local populations. Why you find certain things in certain places. That's how I see it in my mind." Louise explains that the geography of the Turkana Basin is the reason so many fossils are found there. "The rift valley has a major influence in terms of those fossils that we find," she says. "It is because of the tectonic movements forcing these old layers back up to the surface again. Things are then eroded out, and we can then find the little bits of bone fragments on the surface and know where it fits in the excavation." Geographic tools, including GPS and GIS, are very important to paleontologists like Louise. Using GPS, scientists can pinpoint the location of study sites that they can later plot on maps, a process called geo-referencing. Today, paleontologists have the ability to create geo-reference points for fossils found decades ago, allowing the data to be displayed in databases, online maps, and websites. "Any fossil that is found is always marked with a GPS fix, so we have a reference and can get back to it," Louise says. "It is also photographed digitally ... In addition, a lot of the earlier collections that we had made in the '70s and '80s, when we didn’t have GPS, you can bring [those images] into the overall map, the bigger picture, using GIS because you can geo-reference the photographs and actually place those points quite accurately into the new system." To prepare for a career as a paleontologist, Louise suggests taking anatomy, geography, geology, and, especially, biology courses. "I think [taking] biology in terms of just understanding a variety of organisms, including how they may have changed through time and why we have certain species present today and others that are not present," Louise says. Louise recommends families interested in paleontology visit the Hall of Human Origins at the Smithsonian Institution National Museum of Natural History, in Washington, D.C., and The Field Museum in Chicago, Illinois. For college students, Louise suggests looking into attending a field school, such as the Turkana Basin Institute Field School. "Obviously, that is exciting and a real good experience. It opens the doors into getting involved." Louise Leakey is a paleontologist. One of Louise's most important projects is putting fossil collections from the National Museums of Kenya online at www.africanfossils.org. African Fossils is an interactive, 3D experience that allows visitors to investigate a number of hominid fossils. "Im spending a lot of time doing that now, because it excites me and I think it will have a real influence on shaping how kids get excited and involved in this field," she says. to join with someone or something. person responsible for securing money or other funds for an organization or purpose. process of locating something in physical space, usually using coordinates. (1.8-1.3 million years ago) species of primates (hominid) whose fossils have been found in Africa and Asia. speech delivered in front of a class or audience, usually to instruct or impart knowledge. having to do with the structure of the Earth's crust. nearly complete skeleton of an approximately 1.5 million-year-old hominid (either Homo erectus or Homo ergaster) found near Lake Turkana, Kenya, in 1984. National Geographic News: Anthropologist Louise Leakey Carries "Family Banner"